Greta Gerwig delivers an impressive directorial debut from her own semi-autobiographical script. This movie will ring true on so many levels to just about everyone. We've all been teenagers, moving into adulthood and trying to find our true identity in the world. For Lady Bird, it's all about moving out of the environment she's in and moving to college in any big city (but preferably New York). A long the way she loses sight of what's important to her: her best friend and her family. She hates her life and her family (as everyone does at that time in their lives) wanting to break out on her own... but will the reality of her dreams be what she expects, or will she realise, too late, that she should have cherished growing up in such a tight-knit community? The performances are universally excellent, but obviously the relationship between Saoirse Ronan and Laurie Metcalf is the most important one. The two compliment each other incredibly well, delivering a believable family unit. 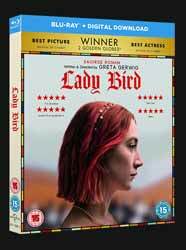 Extras include Realising Lady Bird (15 min, 41 sec in depth behind the scenes feature) and a not overly interesting audio commentary with writer/ director Greta Gerwig and cinematographer Sam Levy. I think, on reflection, it would have been better to have had Gerwig on her own as a few too many thought are interrupted by having another contributor. This is a warm and gentle movie that not only holds a mirror up the viewer, but contains many homages and little touches that you might not spot on the first few viewings.